Capsule Summary: Margaret tries to put together a time capsule while Hawkeye. The penultimate episode of M*A*S*H was a busy one, with several storylines and story strands. Margaret and her time capsule is clearly the A Story. Then there’s the Father Mulcahy/Klinger B Story about the refugees and Soon-Lee, the C Story involving Rizzo’s grenade, and the D Story about the missing chopper pilot. 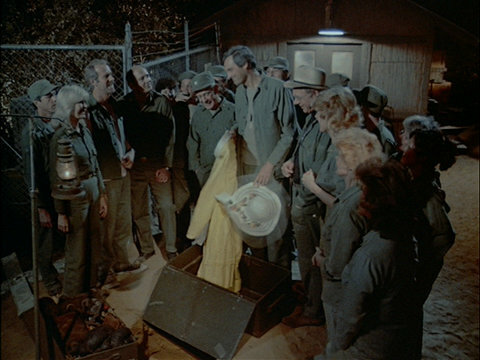 Although the scene near the end of the episode when the camp gathers to bury the time capsule is a great one, the rest of the A Story isn’t. Margaret is too shrill while Hawkeye is too immature. Klinger serving as prison warden for Soon-Lee the suspected sniper is a little weak. Where were the MPs? Why did Klinger believe she was innocent just because her story happened to remind Father Mulcahy of some refugees he talked to? More importantly, why didn’t Colonel Flagg show up to interrogate the prisoner? The dummy hand grenade C Story starts out okay. Igor wanting to turn it into a reading lamp is amusing as is Rizzo using it to scare B.J. in the showers. That should have been the end of the storyline. Rizzo trying to use it again to scare Charles is too much, as is B.J. scheming with Charles to get back at Rizzo. I can believe that B.J. told Charles about the incident in the shower, although it isn’t like the two were best friends who shared everything. B.J. hiding outside the Swamp is too much. I really like the missing chopper D Story. It starts as a bit of a mystery, which is unusual for M*A*S*H. I wonder if Lt. Brannum saving Corporal Stoddard’s life by flying his chopper in 200-foot intervals was based on a true story. It’s an incredible story and is tied nicely into the time capsule storyline. I’m probably not the only one who wishes the episode ended with the burying of the time capsule. The tag scene is unnecessary, although the mention of Frank Burns is nice, and Charles tossing the grenade in the air is a bit too silly. Footage of this scene being rehearsed was included as a bonus feature in the Martini & Medicine Complete Series DVD set. I’ve posted some clips of contemporary news coverage of the last day of filming, which you can find here. The cast buried a real time capsule filled with props from M*A*S*H. I believe in one of Alan Alda’s autobiographies he reveals that it was dug up shortly after they buried it during construction. This episode was dedicated to the memory of Connie Izay, a registered nurse who served as technical advisor for the series from 1977 to 1982. She passed away from cancer in August 1982. Izay appeared in two episodes (“Guerilla My Dreams” and “Dreams”) and several sources indicate she also appeared uncredited in “Morale Victory.” Prior to M*A*S*H, Izay worked as a nurse at Universal Studios, where she started serving as an advisor for Marcus Welby, M.D. “As Time Goes By” was the only episode to air with a dedication, which also makes it the only episode to feature two freeze frames. Wait, Soon-Lee was introduced in this episode? I thought she was a recurring character throughout Season 11. Well. Suddenly, it makes hers and Klinger’s romance in GFA less believable, because it had no time to build up or anything. Not very realistic. No mention of the actual items that were buried in the time capsul? Based on the plot description alone, this wouldn’t sound like an episode I’d be very fond of, but against all odds, I’ve found myself enjoying it more and more over the years. I really like the weary feel of it; it really does seem like the waning days of the Korean War. Maybe because they filmed it after the actual finale, they were better able to capture that feeling? The grenade storyline is just okay, though I really like chopper subplot. And the Hawkeye/Margaret time capsule plot is decent (though I agree, Hot Lips is too shrill, Hawkeye is too immature), until the final payoff, which is fantastic. A very good penultimate episode. I quite liked the grenade C story, purely for how funny it is to see the way the characters react. I’ve never really cared for the Klinger/Soon-Lee B story, as it is almost completely setting up GFA, and is just too unrealistic. The A story is nothing special, in contrast to the D story, which is probably my favourite subplot from this episode. Interesting how when they were burying the time capsule, there was something from every main character, (albeit Burns’ ‘item’ was in a reference in the tag), except Trapper. I wonder why? Yes and the Frank item Hawkeye suggested for Frank didn’t make sense. A scalpel for a guy who wasn’t a very good surgeon to begin with? I was very sad they didn’t mention Trapper either but I’m guessing that’s because there were only a few people who would remember him. Since he made it home safely, there wouldn’t have been any mushy reference they could make. Always felt like there were a few missing episodes between this one and the last one, since we never saw how the Soon-Lee/Klinger romance developed. Someone mentioned the actual items in the capsule weren’t included in the post, so thought I’d put them all here in the order from the show. Broken Fan Belt – To remember the pilot from the D story of this episode in 100 years. Radar’s Teddy Bear – To remember all the soldiers who came over as boys and went home as men. Henry Blake’s Fishing Lure – To remember all the men who never made it home. Cognac from Charles – Because it’ll be over 100 years old when the time capsule is opened. Boxing Gloves from Mulcahy – So when people want to go to war in the future, they can use these to settle it. Klinger’s Black Dress (chosen by Margaret over the Scarlett O’Hara gown that Hawkeye & BJ picked) – To remember all the girls they left behind. As mentioned above, Charles mentions that they didn’t include anything from the “infamous Major Burns”. Hawkeye jokes that they thought about including a scalpel to remember him by, but didn’t want to leave any deadly weapons. There is no mention of Trapper in the episode, unfortunately. Also Kellye’s shoes to stand for standing and Potter’s Zane Grey novel were put in the capsule. I often wondered if the MASH cast and or crew buried their own time capsule at the Fox Ranch containing production items such as props and scripts, inspired by this episode. They actually did bury their own time capsule! I’m sure the story of it is on the site here somewhere, but I think I remember them including the script and other things you’d expect. Of course, it was discovered and excavated relatively quickly, unfortunately, and I think the items were auctioned off. Again, I may be wrong, but I think I remember them asking Fox, or Metcalfe or someone if they wanted to prevent the auction and return the items, but whomever it was allowed the man that discovered it to get the money. The broken fan belt also represents the wounded and the manner in which they arrived at the 4077th. I agree that this was a good set-up for the finale. I agree with Hawkeye, shrill Margret is like a songbird drowning in hot tar. Yes what a shame that Margaret’s last episode filmed is her screaming at everybody. Trying to control what everyone wants to bury? That’s not her job and it defeats the purpose of a time capsule that’s supposed to tell something about the people who buried it. At a certain point someone just needed to tape her mouth so she would stop yelling so much. This was a pretty good next-to-last episode. Maybe they could have emphasized a little bit more that the war was coming to an end, so it would lead more smoothly into GFA; but so be it. It was nice seeing Rizzo, Igor, and Kellye get extended screen time and dialogue. As I’ve stated before, I never bought the love between Klinger and Soon-Lee. It’s way too rushed. She should have been introduced earlier in the season. The time capsule battle between Hawkeye and Margaret had some good moments, even though both characters were annoying most of the time. But it was nice that they came together in the end. The references to Blake and Radar made me misty-eyed back in 1983, and even now (Especially when Potter touches the teddy bear with a melancholy look on his face). 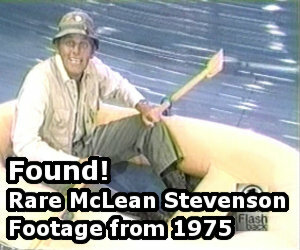 Surely, they could have put something of Trapper’s in the time capsule. Didn’t he leave his hat behind? In summary, I really do like this episode, in spite of my pointing out its flaws. I compare it positively to the Barney Miller episode “Bones”, which served as a lead-in to the 3-part “Landmark” finale. And that is high praise, since I consider Barney Miller to be my 2nd favorite show ever. Think about it. You’re a younger viewer who never heard of MASH and you start watching on METV or some other channel and you have no idea that “Goodbye Farewell and Amen” exists, this would actually make a nice series finale with the time capsule.